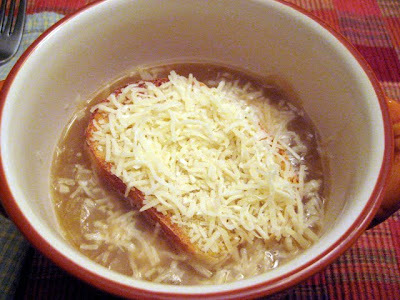 This was the first time I have made Onion Soup since back when I was working at New Haven Restaurant as a prep cook. There we made 25 gallons of onion soup at a time... it was one of their signature dishes. This on the other hand was a much smaller batch of soup. The recipe came from the La Cucina Cookbook. This recipe is from the Piedmont region of Italy. Melt the butter in a large pot over low heat. Add the onions and slowly saute them until golden. Add the wine and let it evaporate. Sprinkle the flour over the onions, stir then slowly add the broth, creating a creamy but not too thick soup. At this point I toasted 2 pieces of homemade French bread. We ladled the soup into our bowls and put the toast on top. Then we sprinkled the toast with shredded Swiss Cheese. It was delicious. I think it was the wine that added the flavor. I don't know why I haven't made this before now. Chris really liked it. I also made a Quiche with Ham and Swiss Cheese. For some reason I thought the soup would not be enough. 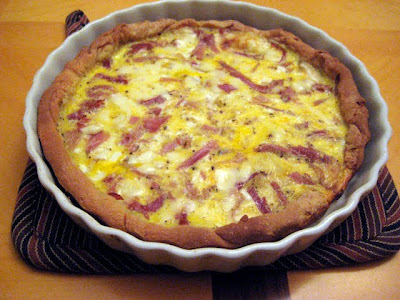 The quiche was quite good and so simple to make. I just made a Pate Brisse for the crust and filled the shell with Rosemary Ham and some Swiss cheese. 1. Sift flour, salt and sugar into a bowl. Add butter and shortening. Cut them into dry ingredients with a pastry blender or 2 knives until mixture is like coarse meal. 2. Sprinkle on and blend in enough ice water to make a workable dough, mixing water in lightly with a fork. 3. Turn dough out onto work surface and, using the heel of your hand, smear the dough away from you, about 1/4 cup at a time. Scrape up the smeared dough into a ball, wrap and refrigerate for at least 2 hours. 4. Unwrap dough, place on a floured work surface, and pound it a few times with your rolling pin to soften it. Roll it out 1/8 inch thick, or to desired thickness. 5. Drape dough over quiche pan, ease it into the pan without stretching, pat into place. Trim off excess, and crimp edges. Refrigerate for 30 minutes. 6. Preheat oven to 400ºF. Remove chilled dough from refrigerator and prick the bottom and sides well with a fork. Line the bottom of the pan with foil and fill with beans to weight the crust. Bake for 10 minutes, until dough is just beginning to color. 7. Remove from oven, remove weights and lining and cool slightly. For filling place cheese and diced ham in crust. Beat 3 eggs and mix with 1 1/2 cups milk or cream, I use low fat milk. Season with salt, nutmeg and fresh ground pepper. Pour filling into crust. Bake for 35 to 45 minutes or until filling is set. The quiche and the soup combined made a wonderful dinner. Lucia, I was thinking today that a onion soup would be really nice. Your post has convinced me that it would be a great idea. Thanks. The quiche looks good too. I enjoy taking a slice of quiche for lunch with fruit or salad-another perfect dish to enjoy.